In 2013, the Seattle Art Museum received a generous three-year grant from the Andrew W. Mellon Foundation in support of programs and initiatives in Asian Art. We dedicated the grant to two important areas for any museum: conservation and curatorial work. Through the grant, we will foster even better understanding of SAM’s rich Asian art collection and we will also forge new relationships with Asian museums, curators, artists and scholars. With these aims in mind, SAM staff visited a select number of partners in Asia last year and we welcomed two fascinating visitors in October 2014 in connection with this project. 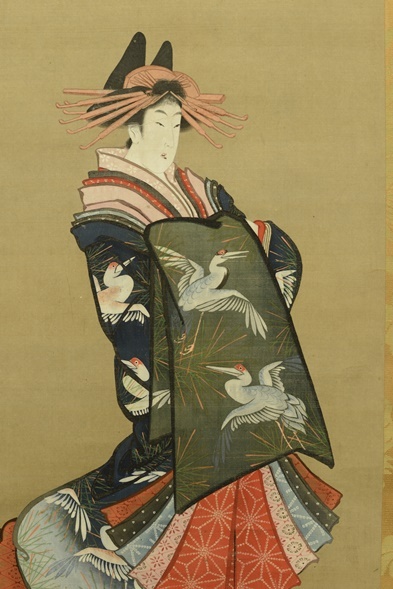 A major goal of the Mellon grant is to conduct a comprehensive conservation survey of SAM’s great collection of Japanese painted scrolls and screens. 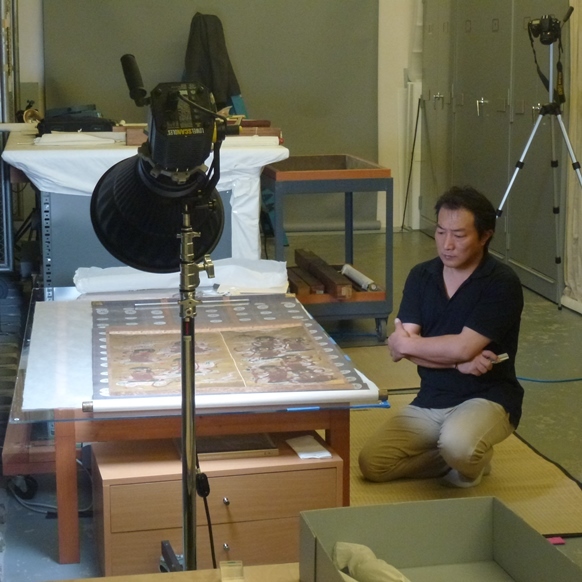 The funding enables us to bring Japanese paintings conservator Tomokatsu Kawazu to SAM two times per year for the next three years to document the Japanese paintings collection, with specific focus on the materials and preservation state of each painting. In early October, Mr. Kawazu was at SAM for the first residency, during which he conducted a marathon evaluation of seventy-one Japanese paintings in two short weeks. Working closely with Chief Conservator Nicholas Dorman, Collections Care Manager Marta Pinto-Llorca and Project Coordinator Rachel Harris, Mr. Kawazu examined each painting, documenting its condition with detailed notes and close-up images. In spring 2015, Mr. Kawazu will return to evaluate a second group of Japanese paintings. 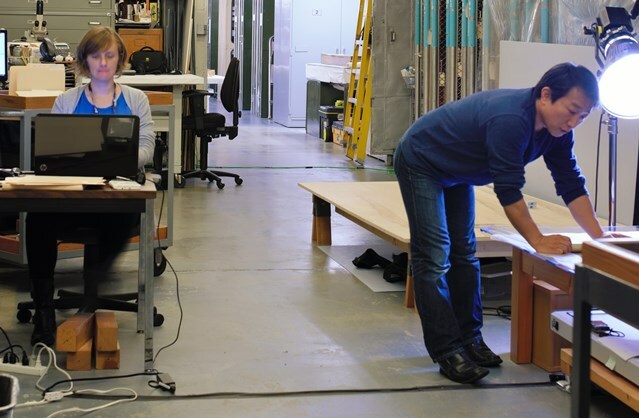 Two important spin-offs of the survey are that the grant enabled us to set up a work station, equipped with the highly specialized tools and materials of the Asian paintings conservator. We are also able to take new photographs of all the surveyed objects, with SAM conservation staff shooting macro shots, inscriptions and other details and photographer Spike Mafford taking high-resolution shots of a selection of paintings. The curatorial track of the Mellon grant is also moving ahead. While Mr. Kawazu was examining Japanese paintings, Eunju Choi, Chief Curator of the Museum of Modern and Contemporary Art, Korea (MMCA) was also in residence at SAM. The Mellon grant provided funds to bring Ms. Choi to Seattle so that she could begin planning an exhibition with Xiaojin Wu, SAM’s Curator of Japanese and Korean art. Tentatively planned for late 2015, this exhibition will offer Seattleites a look at contemporary Korean art never before seen in our city. While in residence at SAM, Ms. Choi gave a sold-out lecture titled: Korea Now: Contemporary Art from the MMCA, Korea. Her talk highlighted MMCA exhibits and offered insight into the work of important contemporary Korean artists. If you weren’t able to attend Ms. Choi’s lecture, check out this article for an overview of her talk: http://www.nwasianweekly.com/2014/10/vibrant-korean-contemporary-art-set-arrive-seattle/. In very different ways, the conservation survey and the new curatorial collaborations give a terrific boost to our collection legacy and our Asian programs, we look forward to sharing its progress with you over the next two years.